As I was driving along in San Antonio recently, I glimpsed a sign that grabbed my attention. Since I wasn’t quite sure I saw it right, I did a big loop to confirm my I had seen (not an easy task with San Antonio frontage roads, by the way). Sure enough, at the Las Palapas restaurant along 1604 in north San Antonio, there were two unusual signs. The other sign read: “Open 24 Hours. 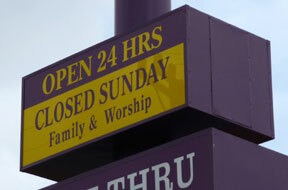 Closed Sunday: Family and Worship.” Now you don’t see that sort of thing every day, even in Texas. When I lived in Irvine, I remember one business that closed on Sunday - a bread shop owned by Mormons. After I got home from San Antonio, I did a little research on Las Palapas. First, a “palapa” is an open-sided, thatched-roof structure that you’d find on a tropical island. It’s sometimes called a tiki hut. The word seems to come from a “American Spanish” word for palm tree. 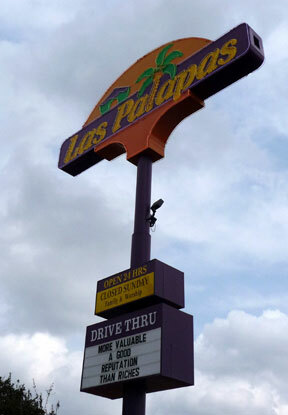 Las Palapas began closing on Sunday to allow employees time with families and an opportunity to worship if they so desire. According to Ron, honoring God is not just about closing on Sundays it is about identifying people everyday with needs and then doing what you can to help them. Ron attributes his success to the grace of God. Many people have helped Ron during the seasons of his life and because of this he has a desire to give back to others. Therefore, Ron and his wife Elssy founded the Jireh Foundation, to assist in caring for widows and orphans. Throughout the city of San Antonio, there are widows and orphans that the Jireh Foundation helps support financially on a monthly basis. Jireh also assists many other non-profit organizations and businesses in the San Antonio community. The word “Jireh” comes from the Hebrew verb that means “to see,” or sometimes “to provide.” It is used as a name for God in Genesis 22:14. The KJV reads: “And Abraham called the name of that place Jehovah-jireh: as it is said to this day, In the mount of the LORD it shall be seen.” A few verses earlier, jireh [now transliterated as yireh] is rendered in the KJV as “to provide” - “And Abraham said, My son, God will provide [yireh] himself a lamb for a burnt offering: so they went both of them together” (Gen 22:8). Both verses come from the story in which Abraham almost sacrificed his son Isaac. But God provided a ram for the sacrifice. I’ve never eaten at Las Palapas. But I’m going to do so soon. I like good Tex-Mex cuisine. 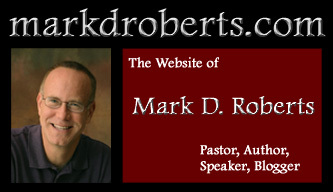 But, even more, I love seeing a Christian entrepreneur who lives out his faith in the context of business. If there’s any way I can support him, I’m eager to do it, especially if it means buying some Tex-Mex food. And if you like good chicken sandwiches, here’s another place to patronize. Chick Fil A is a very profitable Atlanta based quick service restaurant chain with somewhere around 1,400 units. The following links are quick reads that give all of the background info and speak to the issue of the closed on Sundays policy. Ray: Yes, I know this about Chick-fil-A. Ironically, there’s a Chick-fil-A right next to the Las Palapas in the photo. No Chik-Fil-A up where I live in New Hampshire, which is too bad because I love their food and love their policy. On the other hand, we do have Ross Furniture in Dover, NH. On the rare occasions that I buy furniture, I will go there first and probably last (my rocking chair, dresser, dining table, and a bookshelf came from Ross). Their ads say “Open six days, closed Sundays. See you in Church!” “Closed Sundays: See you in church!” is written on the side of their box truck. Also such things as “Pray the Rosary Daily” which don’t do anything for me, but these are good people who live what they believe. Right in the middle of downtown Dover, and it’s been there for years. I love them! it’s great to see they give that time to their employees…we love chik-fil-a for their food and their commitment to giving sundays off.